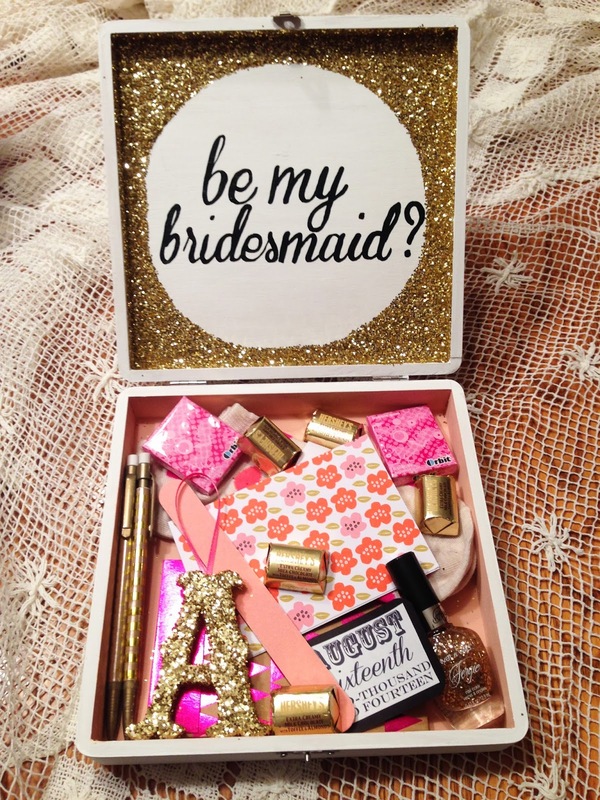 Hey Lets Tie the Knot: Be My Bridesmaid? Here goes the first wedding related post! I purchased my boxes at Michaels using a 40% coupon on all seven (download the Michael's app). We sanded the boxes down and painted the outside white and the inside a peach color. I then chose a font online that I liked best and traced "Be my Bridesmaid", "Be my Matron of Honor" and "Be my Flower Girl." Next came my favorite: the glitter. I used a small styrofoam plate as a barrier to keep the glue and glitter where I wanted. 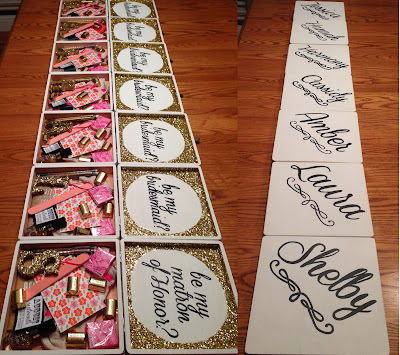 The box was finished off with each maids name hand painted on the lid and a quick spray of Matte sealing spray. Love this idea. I have to know, where did you get those gold mechanical pencils????? I got all of the notebooks and pencils in the dollar section at target! Where did you get your font from?? I LOVE IT!! 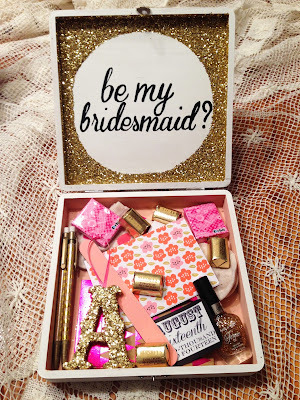 Did you find a website where you could type in "be my bridesmaid" and it would print it out so you could trace it or did you have to trace all of the letters individually?? The Font is called "Coneria Script Demo" and I downloaded it off of www.dafont.com. 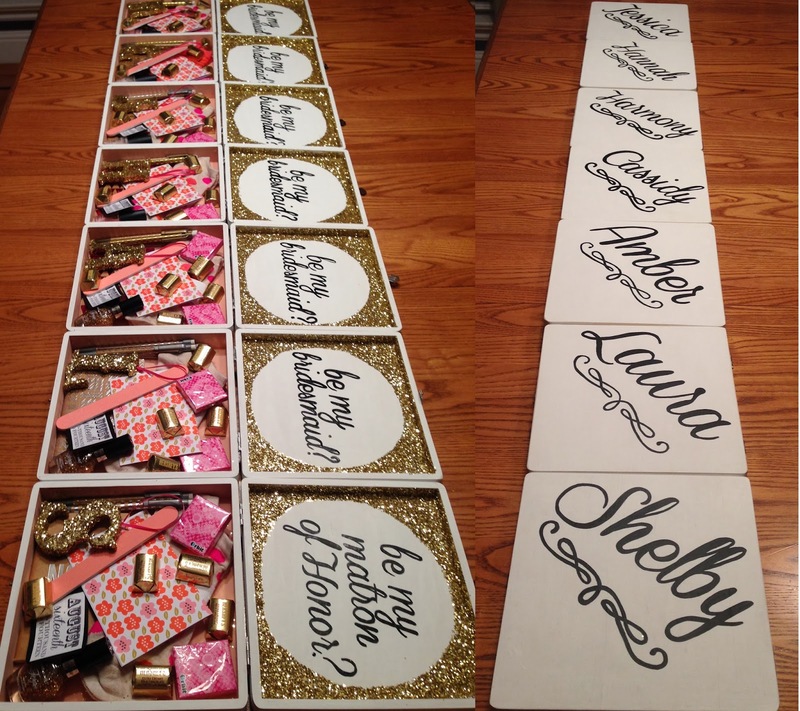 I printed the phrase "Will you be my bridesmaid" out on standard paper and traced letter by letter onto the box. I then painted of the tracing with black paint. where can i find the box? I purchased the wooden box at Michael's craft store. What size approximately is the box? I cannot find a size looks like this one. Love everything in the box, but especially the glitter initial ornament! Was that from Target or did you make it? Thanks so much! I made it! I bought the wooden initial at Michaels, coated it in glue, and dipped it in craft glitter! 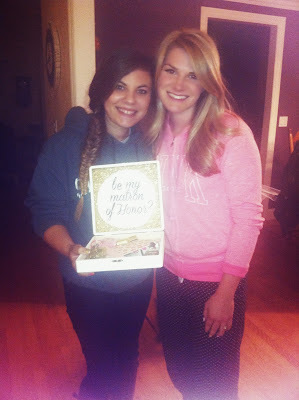 So far this is DEFINITELY my favorite bridesmaid invitation! And you even used the colors I have picked as well peach and GLITTER gold! Thank you for posting everything you put in there, I love details! Congrats to you! Did you paint on the wording using paint brushes? Kelly, we traced the font on with pencil then painted over the pencil with a thin paint brush! When you say you traced the letters, do you mean you used transfer paper or did you print out the phrase and then cut around the letters to trace? I'm confused about the tracing lol. I printed my sayings on regular printer paper and then rubbed a pencil on the back so there was a thin grey layer on the back. Then tape the paper in the place you want the words, use a pen or pencil to outline the words (this will transfer the pencil from the back of the paper to the wood box). Hope this helps! what fonts did you use for the note with the day of the wedding? How did you trace your letters onto the box? I printed my sayings on regular printer paper and then rubbed a pencil on the back so there was a thin grey layer on the back. Then tape the paper in the place you want the words, use a pen or pencil to outline the words (this will transfer the pencil from the back of the paper to the wood box). Then use paint to fill in the words after you remove the paper. Hope this helps! Hi Tori - would you mind explaining this again in a different way? I want to make these this weekend, they are SO cute! I'm a little confused still about the tracing process. You print your wording onto a regular piece of printer paper. Rub a pencil on the BACK of the paper you have printed on. Basically just draw solid grey over the whole back of the image or wording you printed. Then tape the paper to the box (grey side touching the box) now use a pen and simply trace the outside of the words. The pressure from the pen will transfer they grey to the box, leaving you with the outline of your words. Remove the tape and paper and simply fill in the grey words with paint. What kind of glue did you use to hold the glitter in place? These are sensational! All of your fine details, your explanations - thank you so very much for posting this! !